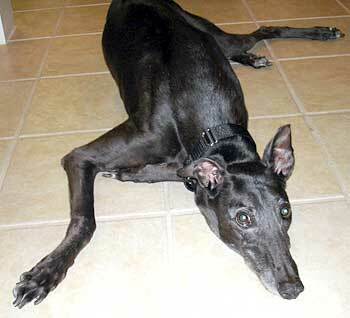 Carina, aka Cisco Ocarina, is a beautiful 12-year-old black female, born October 26, 1993. Her sire is Big Tar and her dam is JF Peaches. Carina was found as a stray, and not much is known about her history. 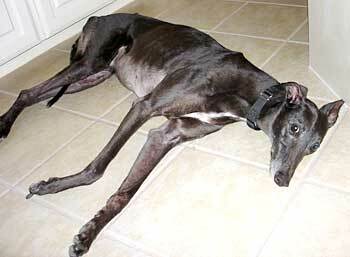 She did race at Gulf Greyhound Park in La Marque, and her last race was in 1996. 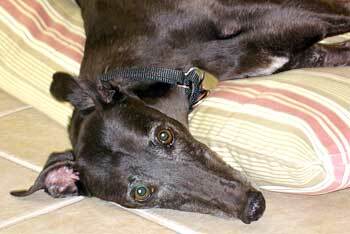 Carina is in a foster home with 4 other greyhounds, and gets along well with everyone. She has those big brown eyes that can melt you in a heartbeat. She is on a weight-gain regiment right now, and hopefully will finish up her medical procedures soon. It is not known at this time if Carina is cat or small animal tolerant.